The super strong epoxy and natural stone aggregate makes it comparable to reinforced concrete but at a considerably lower weight. This makes it easier to handle and less expensive to ship. Rubber feet help protect surface areas. 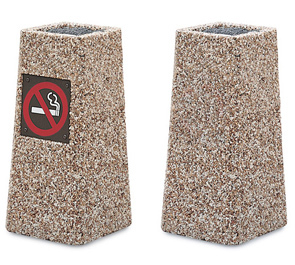 An optional "No Smoking" insert is available as a reminder that cigarettes must be put out.